Family travel programs give students and their families the opportunity for face to face exchange with our partners around the world. In 2019 we will travel to Peru over Spring Break. The Language Link offers a unique family travel experience to Peru’s Sacred Valley and Cusco with an artist’s stop in Lima! This is an opportunity for your family to connect deeply with Peruvian culture through gardening. The theme of this trip is “AYNI”- a Quechua word meaning reciprocity which was deeply embedded in the Incan way of life. We partner with ANIA Tierra de Niños (Children’s Land Project) to connect you with children who are actively caring for the earth through gardening and land stewardship projects in Cusco, Ollantaytambo and Lima. This trip offers the opportunity to roll up your sleeves, dig in the Andean soil and learn about the Incan philosophy of cultivating the earth-one third of plantings should be dedicated to the community, one third should be dedicated to sustaining nature, and one third for the gardener. In this way, the Incans farmed sustainably for centuries, and their descendents can teach us what they know as we lend our labor and friendship to their gardens. Travel by train to the Incan ruins of Machu Picchu, an UNESCO World Heritage Site and one of the Seven Wonders of the World. 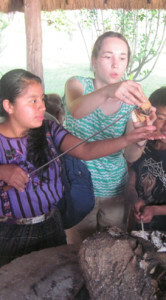 Connect with local school children and their teachers as we help tend gardens following the Incan philosophy of land stewardship. Hike the ruins of Ollantaytambo, Sacsayhuaman and las Maras salt pans. Visit a women’s weaving cooperative in Chinchero and learn about the natural dyes that the Incans have used for millennia- learn to weave, eat and sleep at the cooperative! Stay in the museum-home of Peruvian sculpture Victor Delfín! See Cusco as it celebrates Holy Week with its perfect blend of syncretism and ritual!